What’s on your mind when you hear Russia? You definitely think Russia is the coldest country in the world that is only suitable for winter holidays. Maybe the beach is not a mainstay tour in Russia. But you know, Russia has very beautiful and unique beaches. Some of them are places you must visit, especially during the summer. If we visit Ussuri Bay in Russia, we will find colorful coral which is a glass of rock that will shine when exposed to sunlight. But who would have thought that the glass rock turned out to be garbage. This beach is one of the unique beaches because it used to be the center of garbage disposal bottles of beer, wine and vodka. The habit of drinking was the predilection of the people during the reign of the Soviet Union. After years, ocean waves have turned glass bottles into beautiful colorful rocks. Previously, Russian authorities closed Ussuri Bay because of the danger of sharp broken glass. But now the beach has been reopened after the waves make the glass shards more smooth. This beach is not far from the city of Vladivostok and has become one of the main tourist destinations in Russia. The beach which is also often referred to as Glass Beach or Glass Beach is one of the areas protected by the Russian government. If you want to be on a safe and clean beach, please come to Promenade Beach in Yantarnyy City. This beach is the first beach in Russia to receive a Blue Flag certificate for high safety and water quality procedures. You can see the beauty of the beach which is the mouth of the Baltic Sea from the swamp hills around the coast. Plus you can take pictures on the stairs around the hill so that your photos become instagramable. The city of Sochi is located in the southwestern part of Russia and faces directly on the Black Sea. Of course the city has an exotic beach called Riviera Beach. This beach is near the Sochi River and is the mouth of the river. The entertainment facilities provided on this beach will make you feel at home. Such as beach umbrellas and chairs, trampolines, banana boating, hydrocycle bikes, water parachutes, and others. Plus, you are free to play beach volleyball on this beach. The other beach that is the mouth of the Black Sea is Anapa Beach. As the name implies, this beach is located in Anapa City, part of the Krasnodar Krai region. The uniqueness of this beach is the smoothness of the sand. The beach sand consists of quartz grains, feldspar and damaged shells of mollusks. You are guaranteed to be at home sandbathing and swimming on this shallow beach. Thats why, Anapa is the one of the best places to visit during summer in Russia. Located in the city of St. Petersburg, Laskovy Beach has unique views. Many pine trees in this sand beach area. Plus a variety of carved statues and road areas of wood which are arranged make this beach very instagramable. If you want a beach that is not too crowded, just go to Golden Beach in Zelenogorsk City, part of the Federal City of St. Peterburg. This beach is in the northeastern part of Russia and borders the Finnish Peninsula. The silence of the atmosphere will make you feel at home on this beach. This city can be said to be the southern part of Sankt Peterburg. Taganrog was founded four years earlier than his brother (Saint Petersburg) who was on the coast of the Baltic Sea. 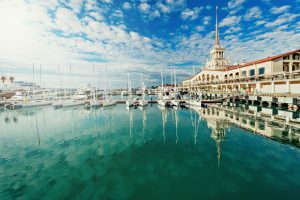 However, the Azov Sea, whose coastline is the foundation of the city of Taganrog, is the most shallow sea in the world so it cannot accommodate the Great Pyotr plan to build its fleet. Even so, we still thank Pyotr because the city has pleasant beaches and sea air. Thats all 7 Favorite Beaches In Russia For Holiday. Many beautiful beaches in Russia make you a lot of reasons to visit Russia. You can visit Russia for two weeks to explore more than one city. There are many tourist destinations in Moscow. Of course St. Petersburg also has many beautiful places. Don’t forget to pack your luggage for two weeks to Russia.